1) What is the legal basis for the EPSR? So far the Commission’s documents have not indicated on what legal basis (or for that matter in what legal form) the Pillar will take shape. However, the legal basis matters (and not only to lawyers): it will determine the scope of the EPSR, particularly regarding the limits of its reach. The EPSR could be considered as a measure aimed at implementing the ‘social clause’ (Article 9 TFEU), which has arguably been limited by being embedded in the legal framework of the Economic and Monetary Union rather than the ‘social’ provisions of the Treaties. However, this initiative also has the potential to limit the way the social clause functions in the future by subordinating it to a more economic rationale. 2) What is the legal nature of the EPSR? There have been many requests that the EPSR concentrate on legally enforceable rights rather than principles, because the former would be the most direct way of improving the lives of workers, the unemployed, and the vulnerable and disadvantaged. The Commission, however, has stuck to its initial proposal and the Pillar will instead consist of a set of principles, as recently confirmed by Commissioner Thyssen’s head of cabinet at the NETLEX 2017 conference in Brussels. Nevertheless, what matters is the legal nature of these principles. Will they be binding and, if so, binding for whom (e.g. EU institutions, Member States)? How will they be implemented (e.g. binding benchmarks)? The legal nature of this instrument, among other factors, will determine its potential impact in the EU. If the Pillar remains a soft law document without a legally binding character, then its future effectiveness is at best doubtful. 3) How will the EPSR change the EU policymaking process? I have proposed elsewhere that the Pillar could act as a sort of ‘social REFIT’. Indeed, if appropriately implemented (e.g. by setting concrete criteria or even binding benchmarks), these principles could help to build a social protection floor for EU policy initiatives across the board to make sure that the EU acquis is also fit for social purposes rather than merely economic or monetary considerations. In this case the Pillar might be a long-awaited blessing, especially in areas other than social policy where the social emphasis has been severely lacking. It could serve as an alternative or at least a counterbalance to the current REFIT process which is underpinned by a cost-benefit analysis that does not readily take social protection objectives into consideration. 4) What new legislative initiatives does the EPSR bring? Of possibly even greater importance than the EPSR itself will be its accompanying initiatives, as well as any future initiatives the Commission will announce in its reflection paper on the EU Social Dimension. The EPSR will be accompanied by a legislative proposal to improve the work-life balance, an interpretative communication on working time, and two consultations of the social partners (on the Written Statement Directive and on access to social protection). These initiatives will provide the first ‘testing ground’ for the EPSR and allow us to ascertain whether and how its principles are going to shape policy initiatives. Any announcements by the Commission of future initiatives will also indicate whether the EPSR is likely to serve as a trigger for further change. 5) What new (access) rights for the social partners? In his announcement of the EPSR initiative, Commission President Juncker said that he expected the social partners to play a central role in the process. And indeed, during the public consultation the Commission received 15,000 submissions from workers and trade unions, many of them requesting a bigger role for trade unions in the EU policy process. New procedural routes for the social partners are certainly a possibility (e.g. a stronger role in the implementation of the EPSR, beyond mere consultation, or increased access to the EU-level policymaking process). It remains to be seen whether the Commission will deliver something new in this regard. The EPSR was proposed in order to instil greater fairness in EMU and EU policymaking. 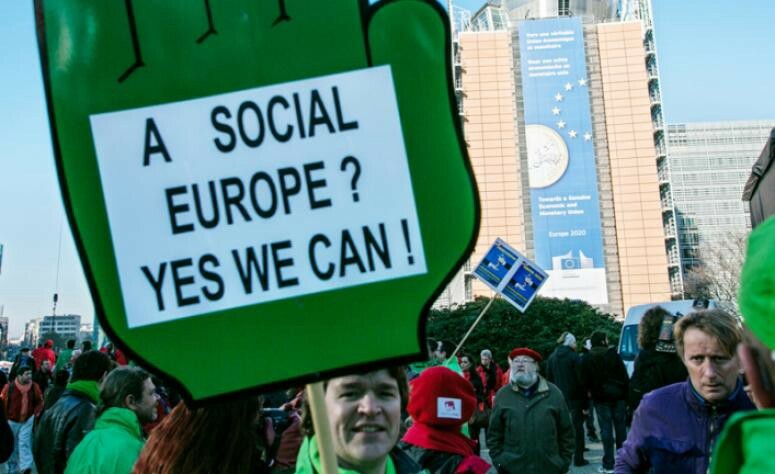 However, it is still an open question as to whether the Pillar will integrate social principles into the European economic governance process or whether it will distort EU social objectives by subjecting them to an economic rationale. We will see if and how the Commission responds to this question on 26 April. Have you read or seen? The European Trade Union Institute is the research & training centre of the European Trade Union Confederation (ETUC).